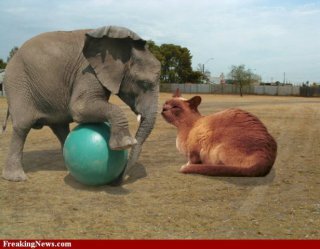 Fat cat takes on baby elephant: photoshopped image by missy via freakingnews.com The State of Pet Health 2011 Report has just been released by Banfield Pet Hospitals, compiled from medical data on 2.1 million dogs and 450,000 cats. 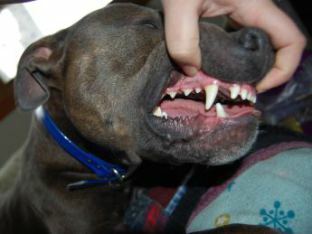 The report lists the trends in dog and cat health, or more appropriate, disease, observed within the last five years. Should we be surprised that among other trends, obesity and diabetes is rising in our precious pets? Yes and no. Though it doesn't surprise me that overweight persons might over-indulge their pets, what does surprise me is that the greatest increases in dog and cat diabetes have been in states like Rhode Island, Idaho, Nevada and Delaware that have lower rates of child and adult obesity than most other U.S. states. Maybe, in fact, pet owners in those states are more likely to worry about their pets' weight and, therefore, seek more veterinary advice. But the biggest health problem for dogs and cats seen by the Banfield Pet Hospitals (located in most PetSmart stores) was dental tartar. For dogs, the study found that dental tartar was followed by ear infections, overweight, dermatitis, and fleas. For cats, the second largest health problem was fleas, followed by overweight, tapeworms, and cystitis (bladder problems). The American College of Veterinary Internal Medicine, which will report its findings on obesity in dogs and cats in June, agrees that dental disease affects the majority of dogs and cats seen by vets. Heartworm is particularly on the increase in dogs in the southeast and, of course, fleas are a big problem for dogs and cats. Dental problems can affect a dog's heart and liver: image via pawnation.comThe Banfield analysis stressed that cats are under-represented at the vet's office because people don't put as much emphasis on healthcare for their cats. Perhaps the recession has played a larger part in diminishing numbers of cats, as wel as dogs, being seen for treatment. How many vets, I wonder, have made pet healthcare more affordable for pet owners during these financially stressed times? The average dental cleaning costs $300 a pop if done by a vet, and my pets' (former) vet charges $500, if you include the blood tests required. If you are like most of us today, $500 for pet dental work is not in the budget even though you wish you could afford to do it. I found an alternative solution. Spray colloidal silver in your pet's mouth a couple times a day. It kills oral bacteria, helps to prevent plaque and decay, and gives them good breath. If they have decay already, it will stop it. My dog's don't mind it at all, they actually lap it up while I'm spraying. It's also safe and works great for ears and eyes if your pet has infection. You can also add it to your pet's water dish. Colloidal silver has also been known to eliminate parasites/worms. Amount depends on size of pet..look online for dosage. You can find it at most health stores, it's about $20 a bottle and lasts for a couple months.